Couscous is a traditional food that originated in Northern Africa. It consists of small balls of durum wheat semolina and has been shown to deliver a wide variety of benefits to the human body. 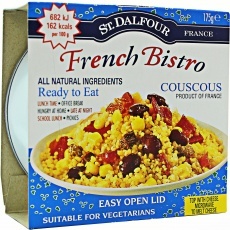 If you are looking to enjoy the all-natural goodness of couscous in a ready-to-eat pack, try St. Dalfour French Bistro Couscous today! St. Dalfour French Bistro Couscous satisfies your hunger cravings with its rich taste and authentic flavor. Loaded with all-natural ingredients, such as kidney beans, red pepper, and raisins, get your taste buds ready for an explosion of flavors that will blow you away with each mouthful. This ready-to-eat couscous meal is suitable for vegetarians, and is an excellent source of protein, carbohydrates, and dietary fiber that will support your active lifestyle by giving you energy, supporting your digestion and saving you time preparing meals. 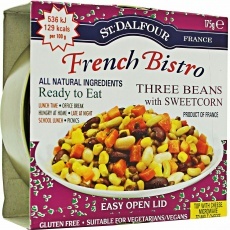 St. Dalfour French Bistro Couscous tastes great when topped with cheese and placed in the microwave. Take it with you at work, school, at the gym, or just eat it as a late-night snack! Satisfy your cravings for authentic couscous right away... try St. Dalfour French Bistro Couscous today! Have a question about French Bistro? What is it, what does it do, how and when to use or something else? Ask us. French Bistro Couscous 175g is a discontinued product. Please browse other products you might be interested in..
“French Bistro Pasta & Vegetables 175g” is currently out of stock. Enter your details below and we will let you know when it's back in stock.